After being at home for summer I went to my first Oxford Sofar Sounds in a few months a couple of weeks ago at Art Jericho. I loved the Martin Grover exhibition at the gallery, with large, incredibly realistic paintings of motown record sleeves adoring the walls - check out my shots from the evening on Flickr here. The first, and one of my favourite acts of the evening (as I'm pretty partial to a chap with an acoustic guitar) was London based Laish, the video above is of his performance at a London Sofar Sounds earlier in the year. A highlight of his set was a point at which he asked the audience (a typically silent Sofar crowd) to make bird noises during his song - the room erupted in beautiful whistles! He's got a lovely, distinctive voice and interesting and quirky lyrics; I always enjoy that due to the nature of Sofar sets you can really listen to the lyrics and see the passion behind the music without any of the distractions that a more conventional, less stripped back show might entail. Some videos of his performance at Union Chapel back in March have just emerged online, if you like what you hear above you can watch those here. It was a pretty last minute decision to go to Baio's instore at Rough Trade East last night - but a great decision! 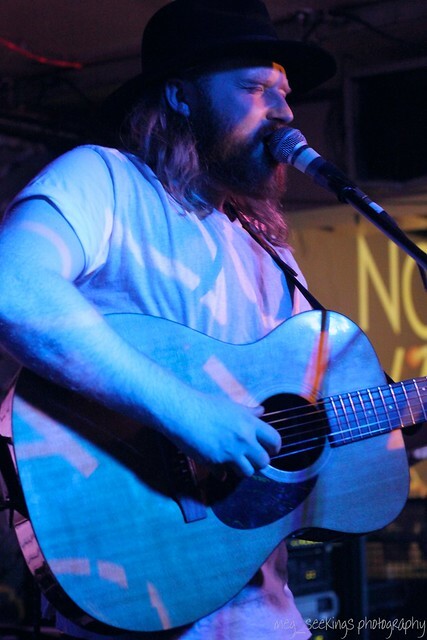 The instore followed the release of his debut solo record The Names just over a week ago on Glassnote Records. The set - though pretty loud for a Monday evening - was superb, and showcased most of the 9-track album. If you're into dance music or Vampire Weekend I highly recommend checking it out - as Baio happens to be the bassist of the band. One of my favourite tracks is above, the opener, Brainwash Yyrr Face - I can't explain why I love it so much but take a listen! If you're not into dance music so much, then try out the track Sister Of Pearl, which I posted about recently, as it's probably the closet to Vampire Weekend's style of music. Chatting to Chris after, he told me that he's wanted to release solo music for a while and has finally found the time, and he's really happy with how the record turned out. He was particularly excited at seeing the inside of the record sleeve for the first time, and as I suspected, was enjoying playing small shows such as this, with Vampire Weekend playing arenas on their last tours. Overall I'm really loving the record and I'd say that if you get the chance to see Baio live - definitely take it up - even just his dancing on stage (similar to the Sister Of Pearl video..) is enough to put a smile on your face! 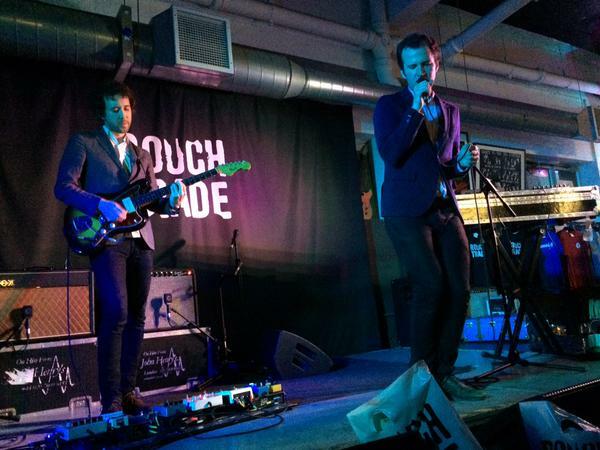 Baio at Rough Trade East. If you're partial, as I am, to acoustic, wholesome music then you should take a listen to the new track from Roo Panes, Stay With Me. 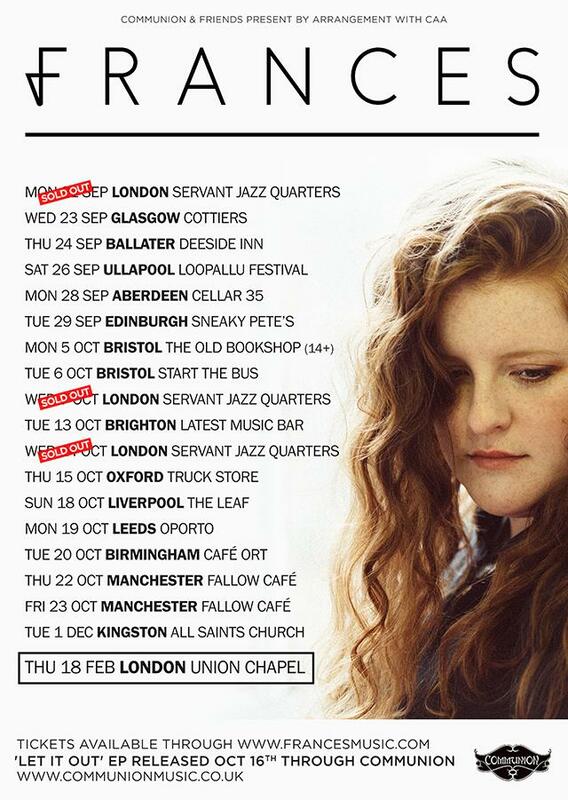 Having recently supported George Ezra at a small Oxford warm up show that I was gutted to miss, moving home for summer just days before, and soon to be supporting Rae Morris on tour alongside Dan Owen, his career seems to be heading in a great direction. I haven't listened to much of his music before but remember seeing and loving his various sessions for Burberry Acoustic (particularly this), a tool through which I have discovered a few great artists. This new track is from Roo's upcoming album Paperweights, details of which are yet to be announced! Dates for the Rae Morris UK tour and ticket links are here, with a big show at London's O2 Shepherd's Bush Empire on 8th October! After desperately wanting to see them live for a couple of years, I was lucky enough to get tickets for Canadian indie rockers Half Moon Run, who played a small show at London's Oslo Hackney to premiere music from their upcoming record, Sun Leads Me On, which is due to be released on 23rd October. After snapping up their debut album, Dark Eyes, in a four for £10 offer at my local music store, I've listened to it an awful lot over the past few years - tracks you are likely to know from it are Full Circle and Call Me In The Afternoon, a track which, with 3 of the band's four members playing drums, was an energetic and fun experience for the band and the crowd alike. I have high hopes for the upcoming record and these were supported by the release of recent singles Trust and Turn Your Love, which both went down really well live earlier this week. The 16 track set included those, and 7 other new tracks, one of which was Hands In The Garden, which the band have just released online. With elements such as the harmonica and beautiful harmonies, it has got what a fan of the band's first record will have come to expect, whilst appealing to first time listeners too. The band play a short UK tour following the release in October, with a massive headline show at London's Roundhouse in March. The show this week was the first in a while to leave me trembling in awe after the set - I was particularly impressed with the showmanship and energy of the whole band - I'd recommend getting along to one of these shows if they're playing near you! Tour dates and tickets are here. There isn't really enough time in the day for me to tell you all how much I love the latest Dawes record, particularly its understated but beautifully performed title track All Your Favorite Bands. When I saw the band at London's Oslo Hackney recently, they performed this as their final track, a departure from the usual loud and energetic encore performance of many bands, but a really powerful and uplifting singalong. The song's message, "may all your favourite bands stay together", is one of the best things, as a music lover, that someone could say to me. Check out the official video for the track which the band have just released, featuring the likes of My Morning Jacket, Brendon Flowers and Conor Oberst. I'm feeling really lucky to have heard this EP before it's release, the stunning One Day We'll Be Fine by Oxfordshire based artist Adam Barnes. Having first discovered his track Apples through an acoustic session on Youtube a few years ago, I was surprised to see that he was headlining a venue at Oxford's Oxjam Festival that I was volunteering at last October. I checked his set out and soon discovered he was actually from Oxford, and then saw him play a full band show a couple of month's later and a wonderful intimate house concert in February. Following the release of his debut record The Land, The Sea & Everything Lost Beneath last year and a bunch of shows around the UK and further beyond, Adam releases his new EP through Wild Native Records on 27th September, and tours the UK in October with Chris Ayer and local supports - Amber Run's Joe Keogh is joining Adam at the London date. Alongside the recently released single I Can't Love You Anymore, the EP has another four tracks, a couple of which (Darling and Nebraska) I've heard and loved at his shows and have been intrigued to hear studio versions of - and I haven't been disappointed. With his carefully crafted lyrics being a large part of his music, the EP, produced by Sam Winfield (who has worked previously with Amber Run and Pixel Fix), allows Adam's vocals to take the forefront. Add to these fantastic vocals the support of Adam's guitar amongst other accompanying instruments and you've got a great EP that is stripped back and emotional whilst still feeling powerfully intense - in short it gave me shivers the first time I listened! At the moment I'm loving the whole EP but a particular favourite has to be Darling, which builds up beautifully to harness some of that intensity that is a definite highlight of the EP and of Adam's music generally! Pre-order the EP through iTunes here and get the first single, I Can't Love You Anymore instantly. I've been a fan of Tom Figgins on Facebook for a few years now, since he supported one of my favourite artist's, Sam Beeton, at a show. I met him a few months back as he was playing alongside Matt Owens as part of his solo project, and I've since caught two solo sets of Tom's. On Wednesday (after a very slow journey to London on a coach in heavy traffic) I went to the Nova Presents... Over & Over night at Notting Hill Arts Club and arrived just in time to see Tom's full band set, a set that left me impressed by the passion and power behind his performance. With a growing listening and recent support from Chris Evans with a performance on his Radio 2 show this year is looking great for Tom, who I'd say is definitely one to watch! Check out the brilliant new video above for Tom's upcoming single Giants Played In Woods Like These - and here's one of my shots shot from the set on Wednesday evening! You can catch Tom supporting Little Mammoths at their London album launch on 14th October at The Borderline, tickets here. As someone who listens to far more male than female artists its always a pleasant surprise when I come across a band such as The Staves. Though they are notoriously quiet artists, their beautiful harmonies give a lot of power to the performance. This is one of my favourite tracks from their latest record, If I Was. They are currently supporting Florence & The Machine on an arena tour with upcoming dates at London's Alexandra Palace, and tour the latest record around the UK across October and November. All dates and ticket links are here. 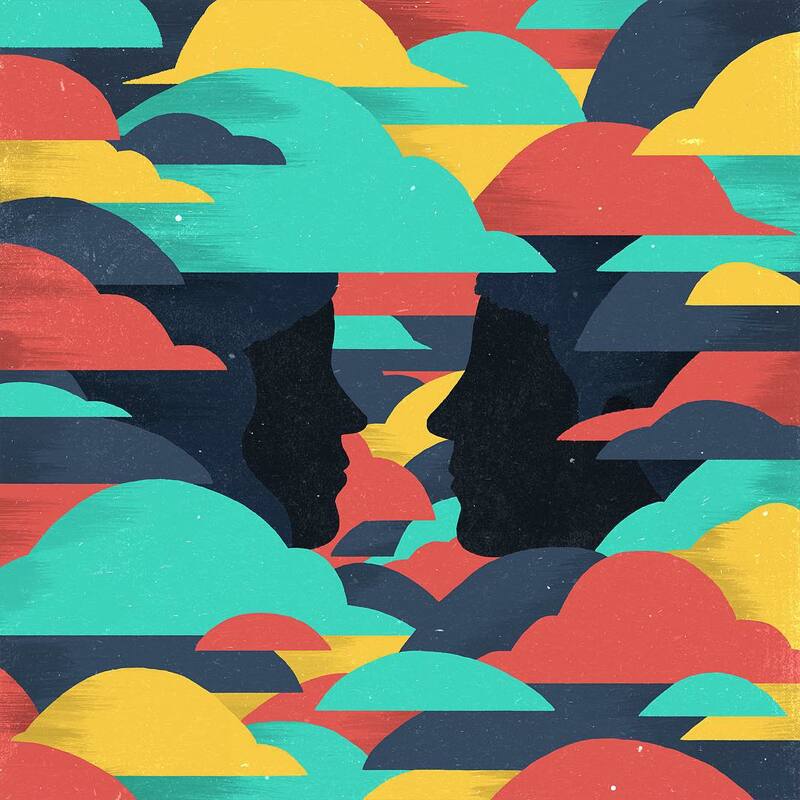 Taken from their upcoming second record, Sun Leads Me On, out 23rd October, here is the latest track from Canadian indie rockers Half Moon Run. 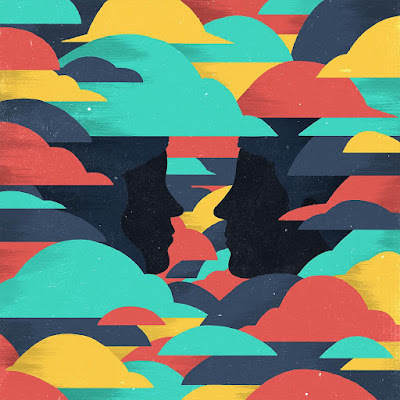 With the success of their beautiful debut record, Dark Eyes, I can't wait to see them at Hackney's Oslo in two weeks where they'll be playing more tracks from the new record. As the support band on the 2013 King Charles tour, I discovered this new band Story Books, whose Too Much A Hunter EP I instantly fell in love with, particularly this song. Having been away for a couple of years the band are back and new music should be coming any minute, and they're playing a London show a week today at The Shacklewell Arms. 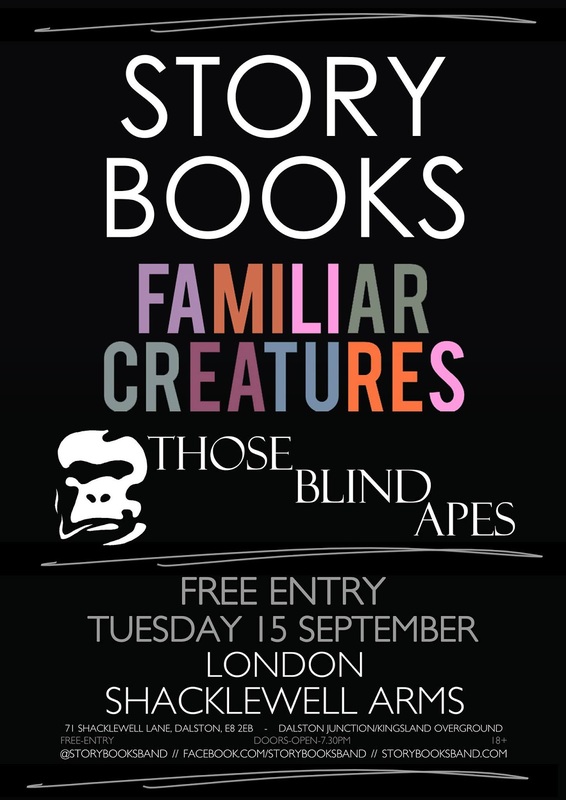 The show is free entry and support comes from Familiar Creatures and Those Blind Apes. 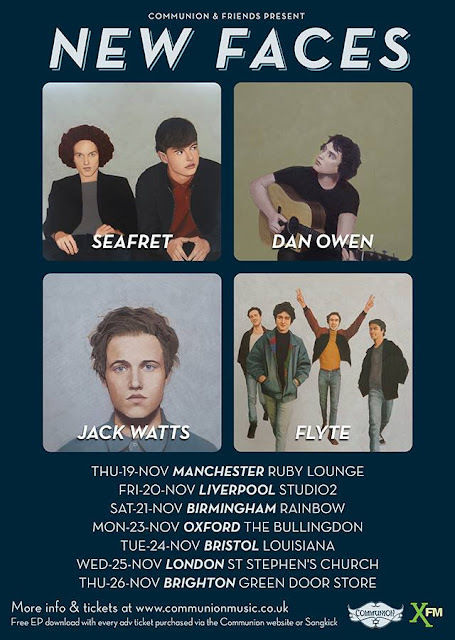 Since living in Oxford I've attended the last two of these tours, and have seen the likes of Amber Run, Kimberly Anne, Frances and Tenterhook, all of whom are going on to greater things following the slot on the tours. Last time I attended the show without having listened to any of the acts previously and was really pleasantly surprised by the calibre of their performances; having heard good things of all four of the acts on this new tour I'm sure this will happen again! Tickets are released through Communion's website here on Friday 4th September at 9am. At £8 (£10 for London) a ticket thats £2 per band, and you might just discover your new favourite artist. Certainly worth a punt! 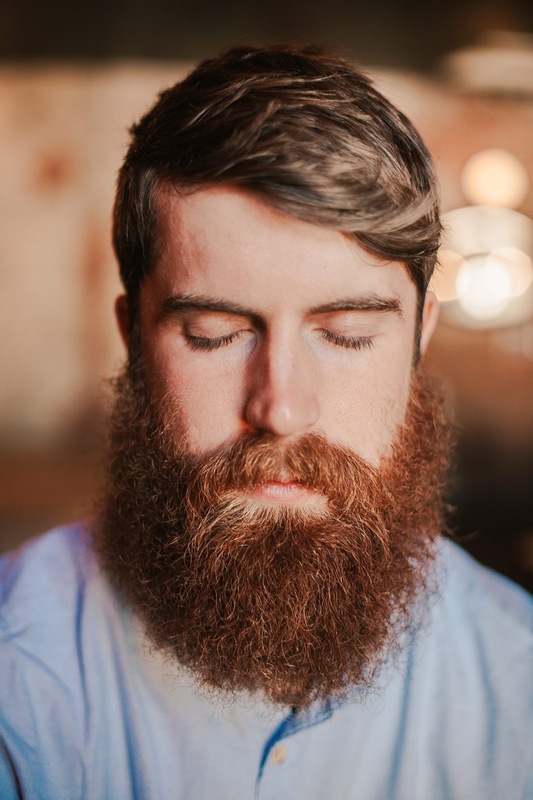 Take a listen to the new track from Oxford acoustic artist Adam Barnes, entitled I Can't Love You Anymore, and taken from his upcoming EP, One Day We'll Be Fine. First discovering Adam's music through an acoustic session a few years ago, I saw him play a house gig earlier in the year, and loved the passion and simplicity behind the performance - something that always comes across in his recorded music. The lyrics and prominence of the vocals in the track loads it with emotion, giving it a raw feeling whilst the layered vocals of the chorus give the effect of a big song that the crowds on Adam's upcoming UK tour will happily sing along to. You can pre-order the five track EP which is released on 29th September from iTunes here, and you'll be able to download this track straightaway. I'm currently taking a listen of the EP which I've been sent to review and loving it - I'll write a post about it closer to the release date. Also, Adam Barnes tours intimate venues across the UK with Chris Ayer in October, dates and tickets are here.